John Paul from Singapore started his Thailand fishing holiday with a visit to Palm Tree Lagoon in Ratchaburi. On arrival a predator rod was soon cast towards showing fish in addition to two rods fished on a deep spot covered with several kg’s of groundbait. It wasnt long before the predator rod burst into life and John Paul was attached to the first fish of the day. The predator embarked on several deep runs before it was overpowered by the heavy fishing equipment and slowly led to the waiting net. The net was parted to reveal a beautiful Wallagu Attu weighing approximately 15kg’s. After releasing the fish back into the lake the predator rod was rebaited with a large fish section before being cast back to the productive spot. Several further fish followed on the predator setup with Pacu, Asian Redtail and Amazonian Redtail Catfish all being landed in the following hours. The carp rod remained eerily quiet with nothing but a few line bites to show over the baited area. Suddenly a high speed run developed on the carp rod seeing line removed from the spool at an alarming rate. A fifteen minute battle followed which saw the Singaporean angler expertly playing the fish up and down the margins of the lake. The continued pressure soon took its toll on the fish and saw the carp languishing in the margins just out of netting range. With one more gentle pull the carp was soon brought over the waiting net and brought onto the unhooking mat. 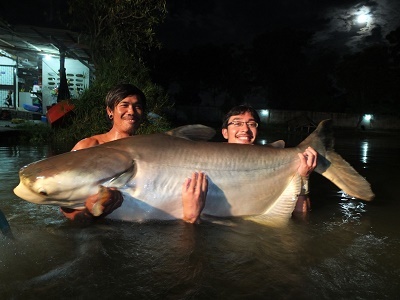 The Giant Siamese Carp on this occasion was estimated to weigh 35kg’s and was quickly returned after photography. After rebaiting the carp and catfish area with a good helping of groundbait the rids were ince again placed on the spot. A further hour passed without any action before the carp and catfish rod ripped off with another high speed take. The fish on this occasion bored deeply into the depths of the lake displaying an unstoppable power as it continued to strip yard upon yard of line off the reel. 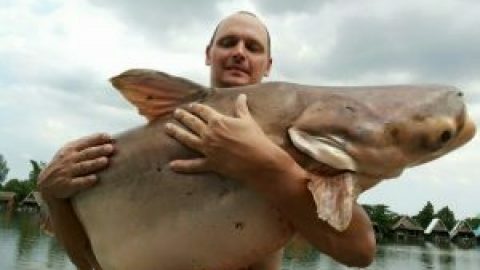 It was clear that the angler had hooked one of the lakes monster Mekong Catfish as the unseen monster fish continued to plough around the far end if the lake. Continued pressure from the angler saw the Mekong Catfish respond with ever greater displays of power causing a massive bow wave to appear far out in the central part of the lake. The dogged battle continued for almost an hour with the rod at full compression for the majority of the time. Continued pressure was piled onto the fish causing it to turn in its tracks and start to head towards the angler. John Paul wound line back onto the spool as fast as he could to keep in contact with the monster Mekong Catfish which proceeded to chug up and down the margins for several more minutes. Finally with one last roll the Mekong Catfish was finally netted and brought to the lakeside where spectators had gathered behind the exhausted angler. 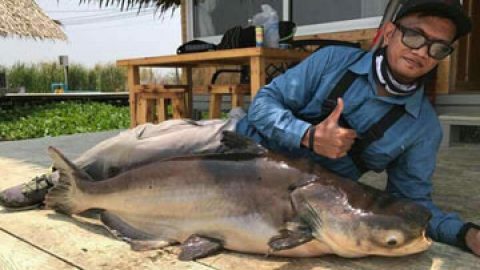 After allowing the monster catfish a short while for recovery the heavy weight catfish was identified as a fish which has regularly topped 95kg’s on previous captures. Trophy shots were quickly taken before the monster Mekong Catfish was lowered back into the water where it immediately powered off back into the lake. Fishing at Palm Tree Lagoon for the day had now ended and the weary angler retired fir the evening in readiness for the next days predator fishing trip at IT Lake Monsters.